Annan Athletic are still looking for their first points in the Betfred Cup after Motherwell lifted the points against a workmanlike Annan team who went a goal down in the 16th minute to a sensational shot from man of the match Marvin Johnson. It was a goal out of the blue from almost an impossible angle wide on the right which made you wonder if it was intended or not but it was a goal which completely deceived Annan keeper Blair Currie. Annna lost the services of their playmaker Barry Cudihy in the 30th minute to be replaced by Liam Park but it was the steel men who continued to press forward and they were very unlucky not to double their lead in the 41st minute when Steven McManus connected with an Ainsworth corner with the header crashing off the front of the cross bar. Annan squared the match before half time when a well constructed move down the left flank between Jean Guy Lucas and Tony Ribeiro ended with Ribeiro’s cross being headed into the net by Rabin Omar who managed to time his jump perfectly in front of the defender to guide the ball past Craig Samson form 5 yards. It was just the tonic that the team and the home support were looking for going into half time. Motherwell started the second half on the front foot and 2 goals in a 3 minute spell secured the points for the visitors. Man of the match Marvin Johnson once again done the damage when his trickery eluded Lucas wide on the right and his low cross caught Black on the turn and Louis Moult’s deft header went past the outstretched arm of Blair Currie to put the visitors ahead for a second time. 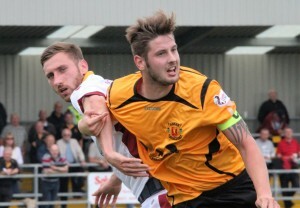 Annan’s slender hopes of lifting anything from the match were dashed minutes later when an unfortunate slip by Annan’s man of the match Steven Swinglehurst presented Louis Moult with a clear run on keeper Blair Currie and the Motherwell striker made no mistake to tuck the ball into the corner of the net past the advancing Annan keeper. This was another tough call for Annan, they have faced three stern tasks against Motherwell, Rangers and Stranraer but it gives the manager and the fans a chance to weigh up the potential of the squad ahead of what will be a major challenge for Annan to repeat the performance of last seasons team in what is sure to be a competitive league this season. Next weeks final match in the Betfred Cup will be more akin to the quality of opponent they will face in league 2 against East Stirlingshire at Ochilview with a different type of challenge to what they have experienced up till now. Annan Athletic – Blair Currie, Steven Black, Jean Guy Lucas, Raffi Krissian, Steven Swinglehurst ( Adam Ashgar 80 min), Peter Watson, Barry Cuddihy ( Liam Park 30 min), Rabin Omar , David McKenna, Max Wright, Tony Ribeiro ( Przemyslaw Dachnowicz 67 min). Substitutes not used Alex Mitchell, Scott Norman, Connor Liddell, Liam Gibson. Motherwell – Craig Samson, Richard Tait, Steven Hammel. Ben Henegman, Steven McManus, Lionel Ainsworth ( Domnic Thomas 80 min ), Carl McHugh, Louis Moult, Marvin Johnson ( Dylan MacKin 80 min), Keith Laslly, Lee Lucas (Chris Cadden 34 min ), Substitutes not used – Dean Brill, Louis Laing, Joseph Chalmers, David Turball.